Soldiers of the 4th Infantry Division hunkered down in a cellar near Prum, Germany just before Operation Grenade, the crossing of the Roer River in February 1945. Cold, wet and hungry Soldiers hunkered down in foxholes, side by side with complete strangers. 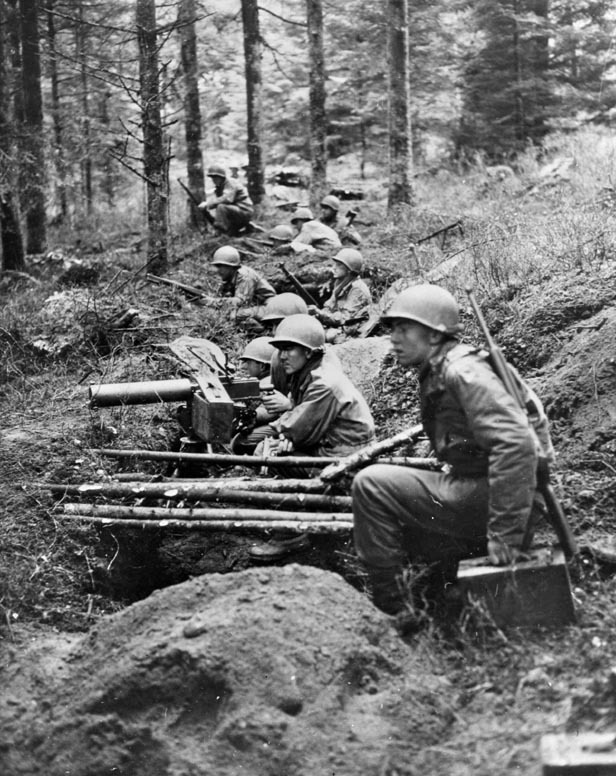 In two weeks, the 22nd Infantry had lost 151% of its riflemen while fighting for six thousand yards of ground in the Hurtgen Forest. Urged forward time after time, the line companies had endured an onslaught of German artillery barrages, machine gun fire and minefields. 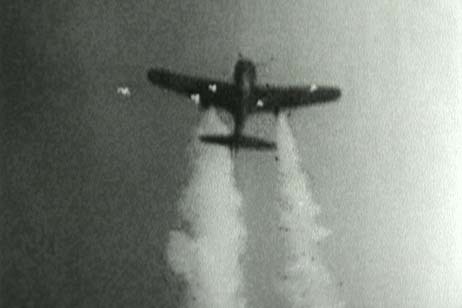 Many attacks had been stopped cold, smothered by German shells and bullets. So many men had been lost that the rifle companies were filled with green replacements thrown into the line with bewildering speed. Once considered the pride of the 1st Army, the 22nd had become a shell of its former self. The attacks continued with relentless intensity until the 22nd Infantry had lost almost all its veteran dogfaces, the men who had come ashore at Utah Beach earlier in the summer. Somehow, the regiment ground forward, inch by inch against withering fire and counter-attacks until by the end of November, one of the 22nd Infantry’s battalions had reached the outskirts of Grosshau, Germany, the last town before the Roer Plain. Take the town and another push would thrust the entire 4th Infantry Division into open ground where the 5th Armored Division, waiting in reserve, would exploit. On November 27, 1944, B Company 1st Battalion 22nd Infantry advanced into a German kill zone while pushing on for Grossau. Pinned down by machine gun fire, B Company was soon hit by an artillery and mortar barrage. 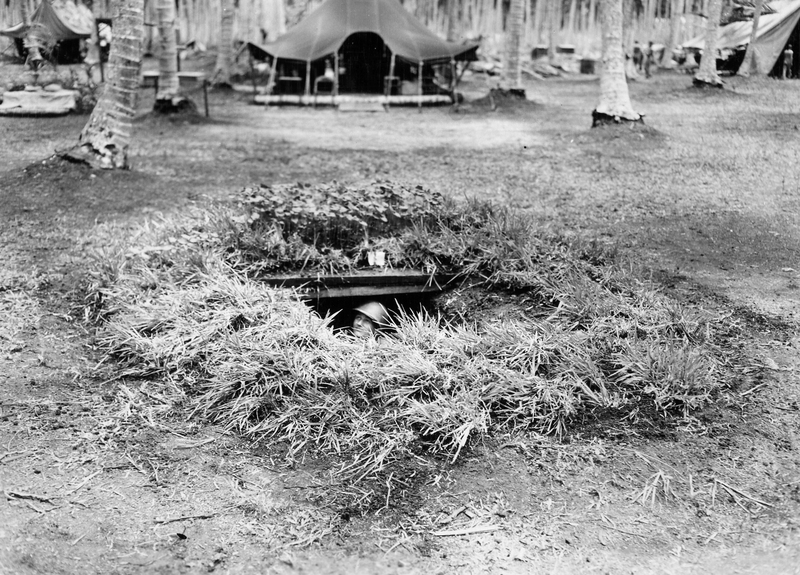 With casualties mounting, an acting squad leader named Private Marcario Garcia launched a one-man attack on the machine gun nest. 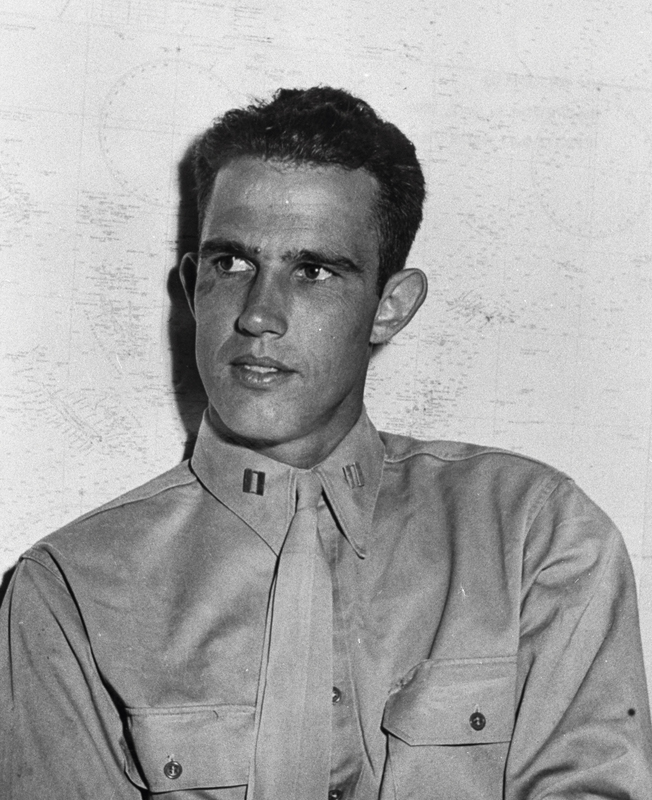 Despite being wounded, he pressed his assault, killed three Germans and knocked out the machine gun. He returned to the company line, which was now being raked by another machine gun nest. He located it and stormed the nest, killing three more Germans and capturing four others. The second attack freed up B Company and the advance continued. Only then did Garcia go to the rear for medical treatment. 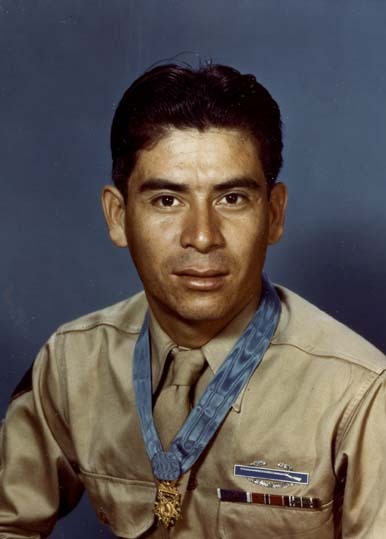 Private Garcia received the Medal of Honor for his actions that day, the first Mexican citizen to receive America’s highest award for bravery. 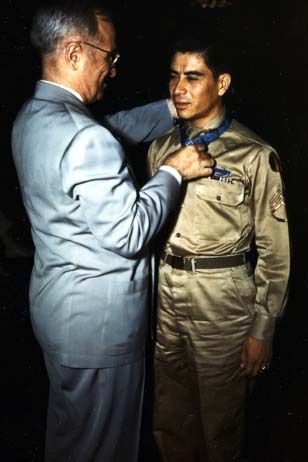 He became an American citizen in 1947. 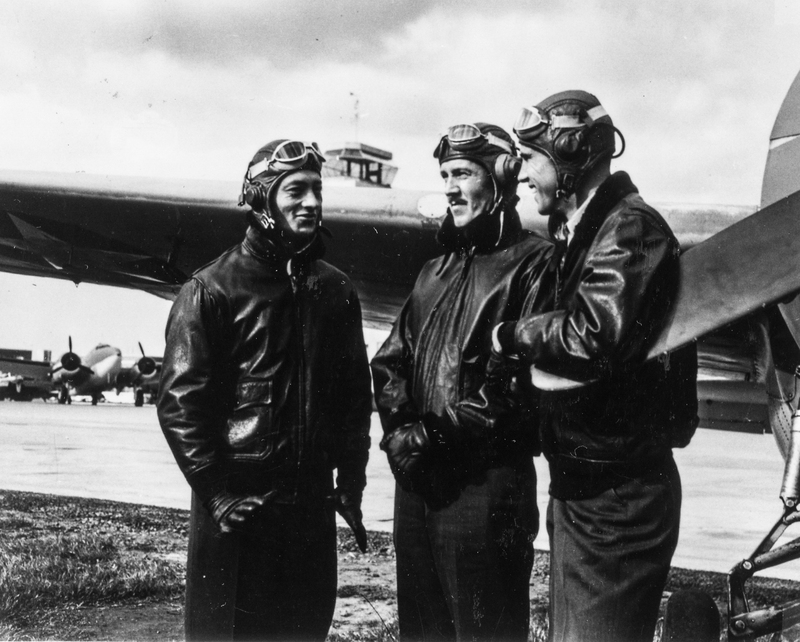 Shortly after President Truman bestowed the MOH on him at a White House ceremony in 1945, Garcia tried to order food at a restaurant south of Houston, Texas. The owner refused to serve him because he was Hispanic. When Garcia protested, the owner beat him with a baseball bat. Walter Winchell later reported on the incident, and Garcia’s beating became a rallying point for Latino-Americans. On the 29th, 3rd Battalion, 22nd Infantry fought its way into Grosshau with the help of a platoon of tanks. The Germans defending the town refused to surrender, and the fighting devolved into point-blank building-to-building battles. Grossau, which had been subjected to countless barrages of American artillery, was almost completely destroyed in the fighting. Germans held out in cellars and within the ruins until nightfall, but the 3rd Battalion eventually cleared them out and secured the town. One more push and the regiment would clear the Hurtgen Forest and break into the open ground beyond. The regiment was ordered forward, reinforced by the 46th Armored Infantry Battalion, the regiment tried to clear the Hurtgen on the 30th. Little progress was made beyond reaching the woodline on the far side of Grosshau. On the 1st, 2-22 and the 46th tried again. The men ran into a massive German artillery barrage that pinned them down and savaged their ranks. The Germans counter-attacked and flung the 2nd Battalion back. The Germans were stopped only when the battalion’s reserves were thrown into the fight. By the end of the day, 2-22 was down to a hundred and twenty-five men. 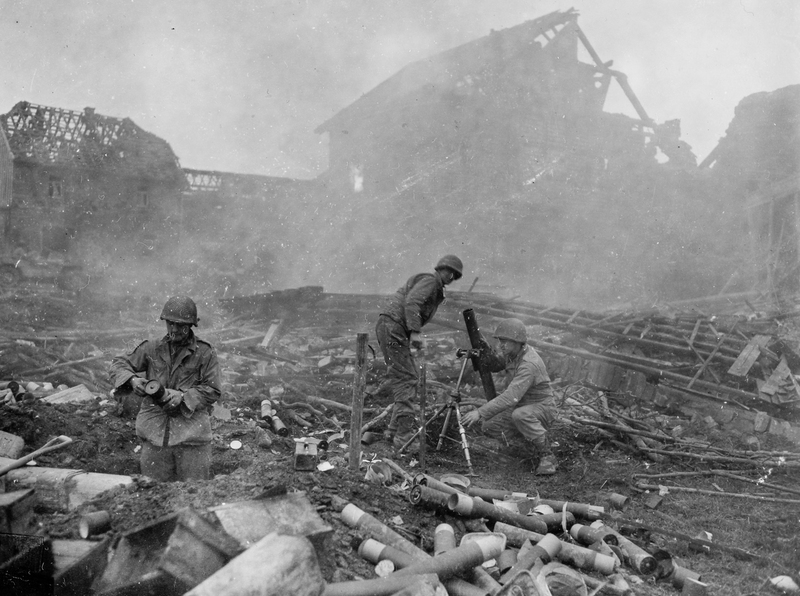 On of the 22nd Infantry’s 81mm mortar crews firing in support of the rifle companies holding off a German counter-attack at Grosshau on December 1, 1944. 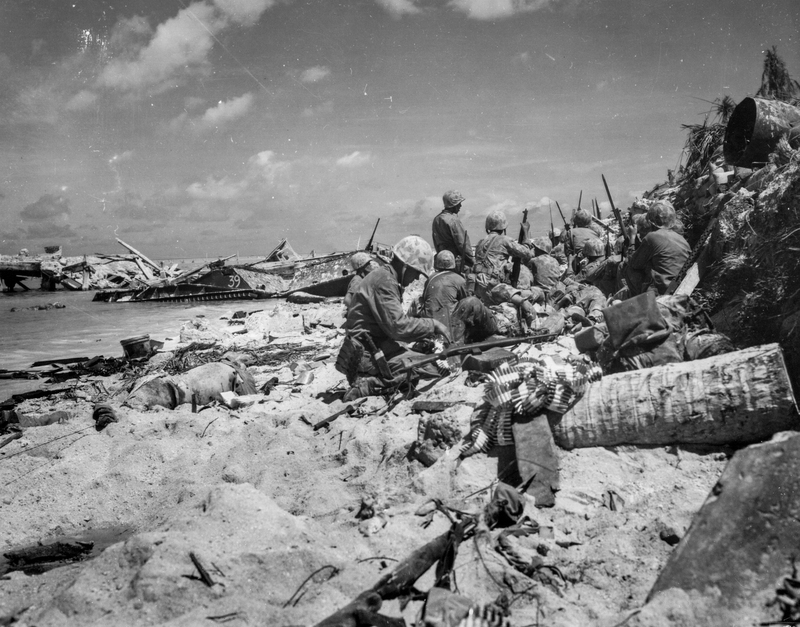 Colonel Charles T. Lanham, the 22nd’s commanding officer, saw that his men had nothing left to give. With his battalions down below company strength and the Germans massing on his northern flank for another counter-attack, he organized a scratch force composed of headquarters troops and supply clerks. That gave him a hundred man reserve. 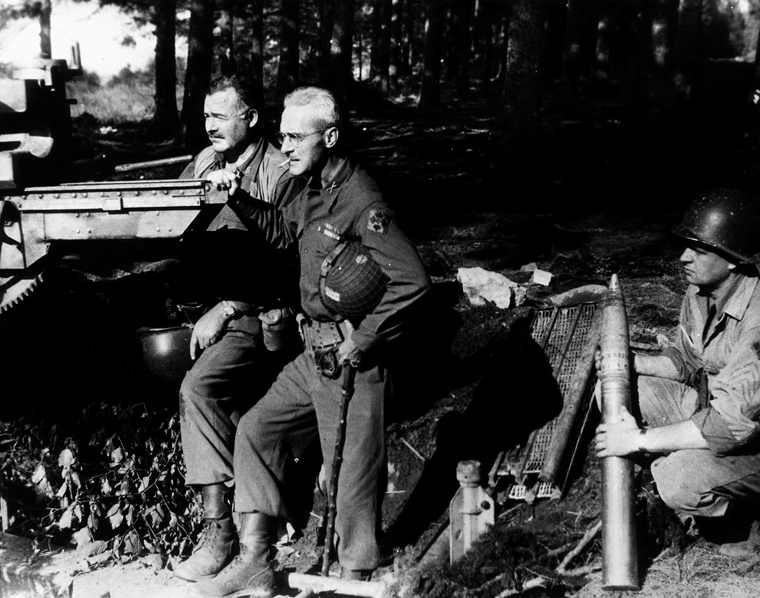 Ernest Hemingway and Colonel Lanham together in the fall of 1944. The Germans hit Lanham’s 3-22 the next day in a furious counter-assault. The onslaught was too much for the battalion, and one skeletal company was overwhelmed. The Germans poured into the regiment’s rear, hitting both the headquarters of 1st and 3rd battalions. Lanham ordered his men to hold on and keep fighting. He threw in his scratch reserves, supported by a few tanks. 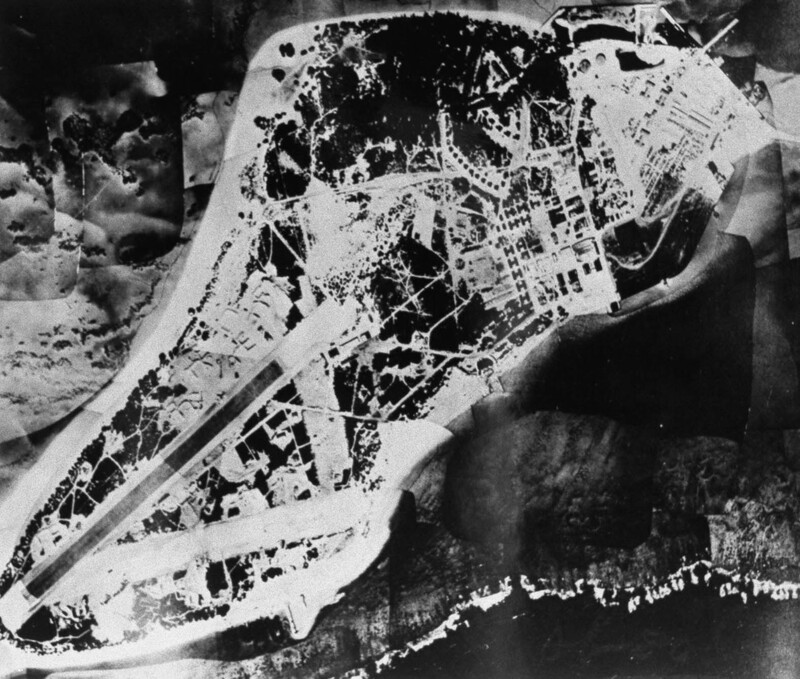 They contained the German breach, cleared it and restored the line. That night, the 4th Infantry Division commander, Major General Raymond Barton, sent in a regiment from the 83rd Infantry Division to effect a relief in place. 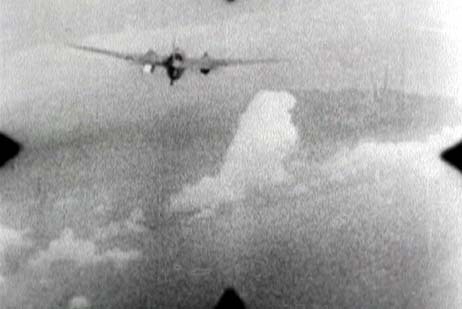 As it was underway, the Germans hit the 22nd again and overran part of 1-22. 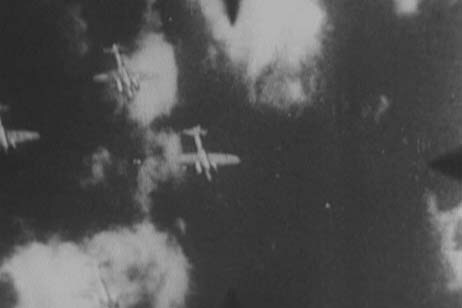 Again, headquarters troops and a few men from a heavy weapons company contained the German attack and eventually threw it back. 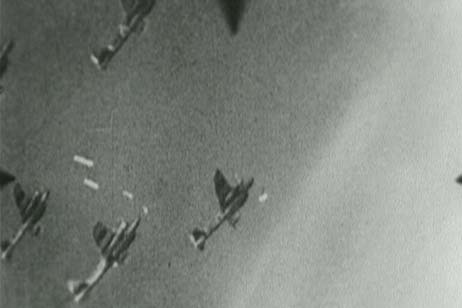 Later that day, as the 22nd was pulling out, about thirty Luftwaffe fighter-bombers made a final, parting attack on the regiment. 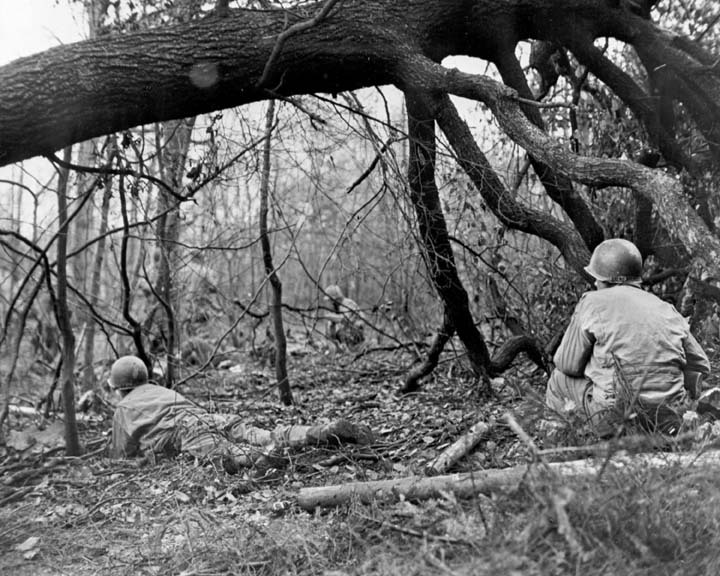 Fortunately, the trees that had sheltered the German defenders from American air power returned the favor for the 22nd that day, and few men were hit in that last crucible in the Hurtgen Forest. Grosshau, Germany December 1, 1944. 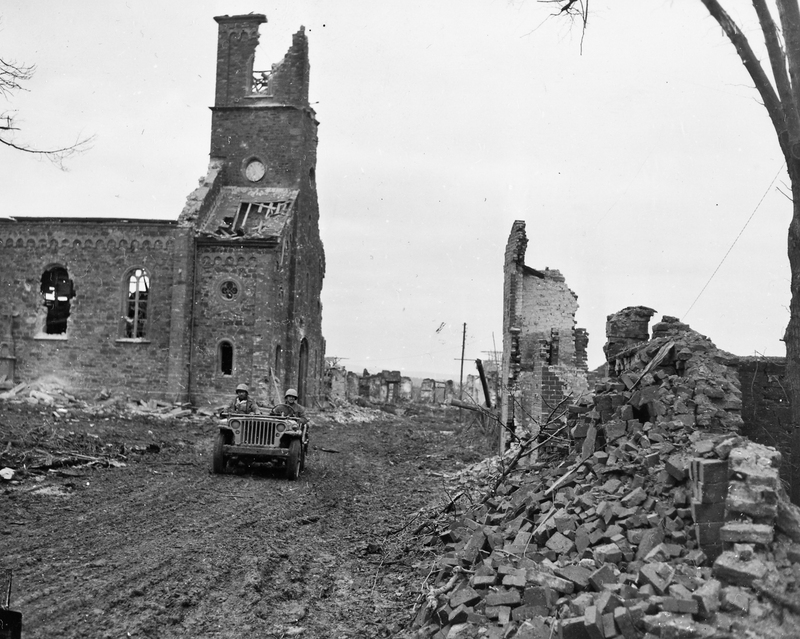 A jeep from the 22nd Infantry moves among the ruins. 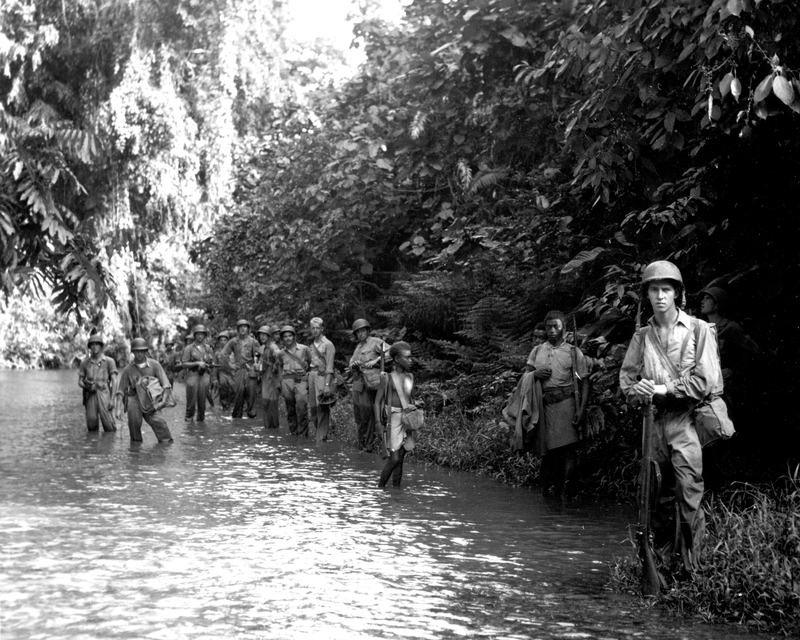 In eighteen days of close quarters combat among the woods and hills of the Hurtgen, the 22nd Infantry suffered 2,773 casualties. They’d gone in with a total strength of about 3,200 men. Everyone suffered, not just the line units. In the Hurtgen, there were no rear areas, only targets for German long-range artillery. During the battle, Lanham’s men captured 762 German soldiers. 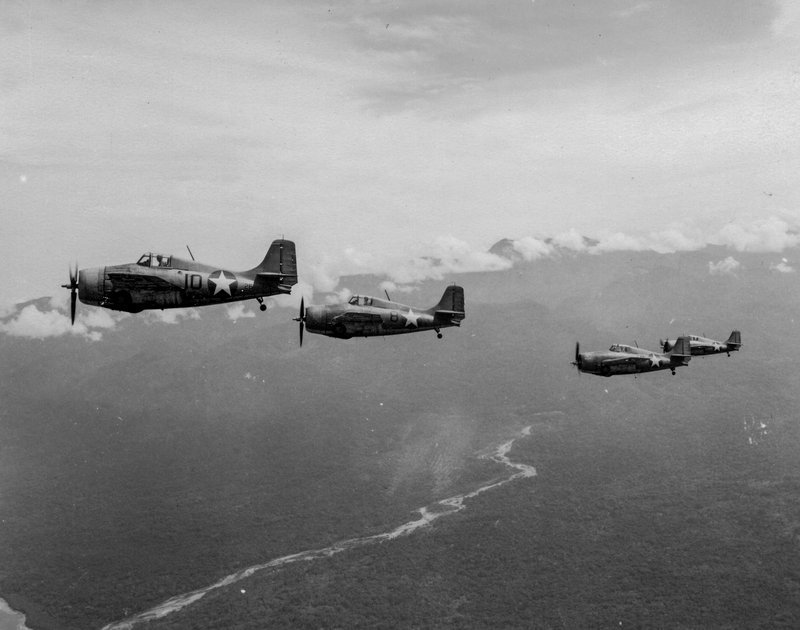 They had advanced six thousand yards and had taken their main objective despite some of the worst terrain and most formidable defenses the U.S. Army encountered in Europe during World War II. 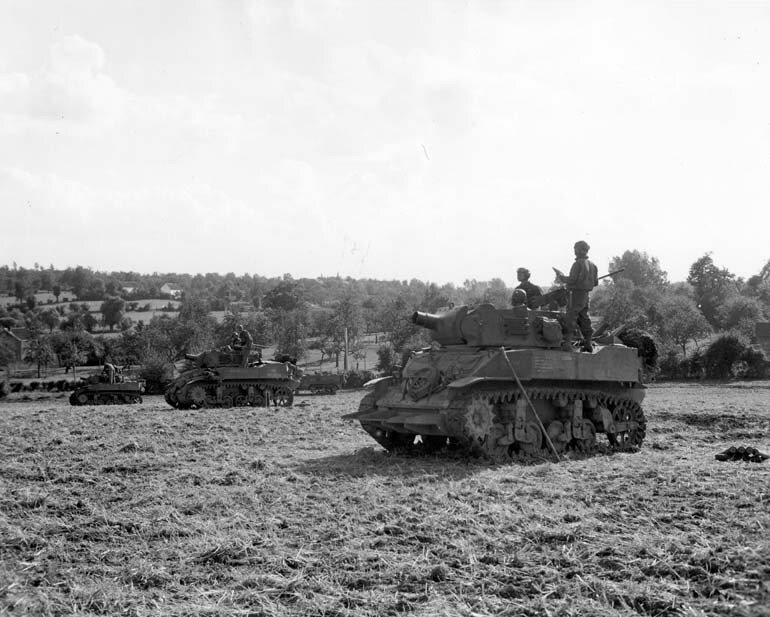 M8 75mm gun motor carriages of the 113th Cavalry, Iowa National Guard, conduct a fire mission with their 75mm guns outside of Heure le Romain, Belgium on September 9, 1944. The cable system employed to right the Oklahoma had to be reset every few days as the ship began to roll. It was slow work and took months to complete. Four hundred and twenty-nine men died aboard the Oklahoma. Only the Arizona‘s destruction cost more American lives on December 7th. 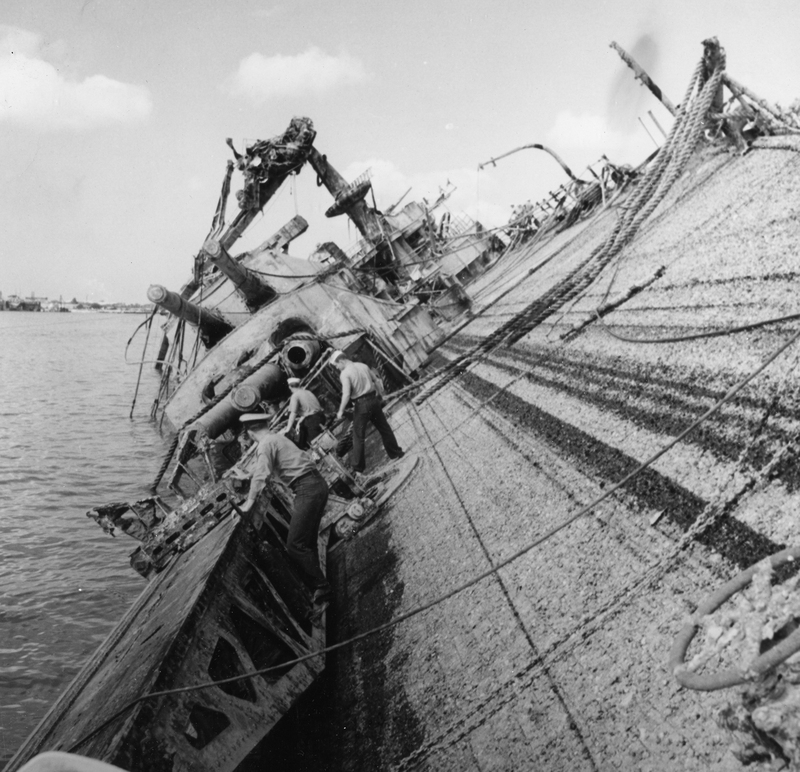 Most of those sailors died within her hull, and as salvage work began on her in mid-1942, one of the first tasks was to recover those remains. For the sailors, divers and civilian contractors assigned to the vessel, the work was gruesome, dangerous and emotionally taxing to the utmost. 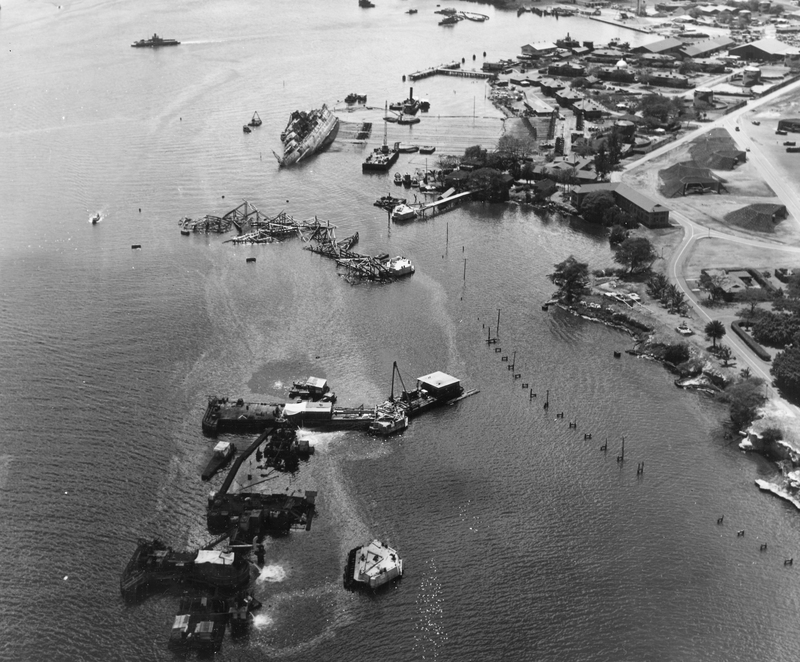 From the spring of 1942 to the summer of 1943, the salvage operation continued. Patches needed to be welded to the hull to cover the torpedo damage and make the ship watertight again. 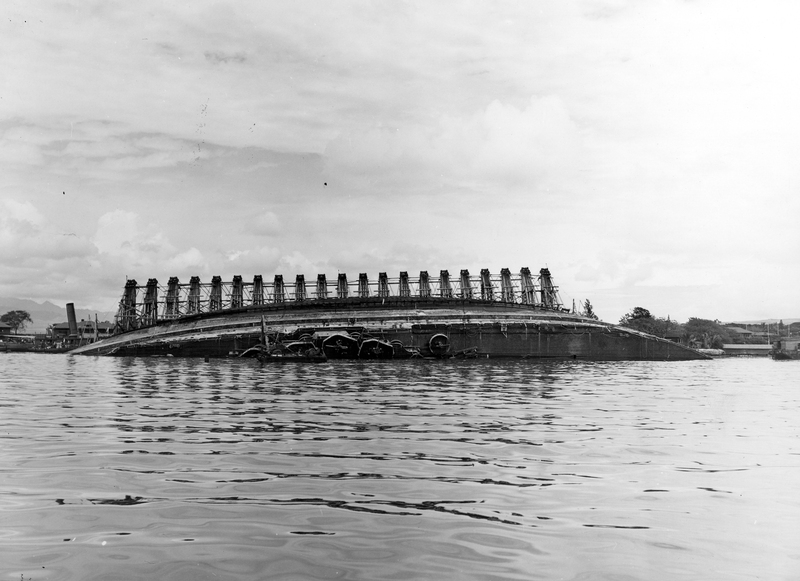 Teams of divers and workers cleared out ammunition, cut away damage and pumped out the thousands of gallons of fuel still remaining in the battleship’s tanks. 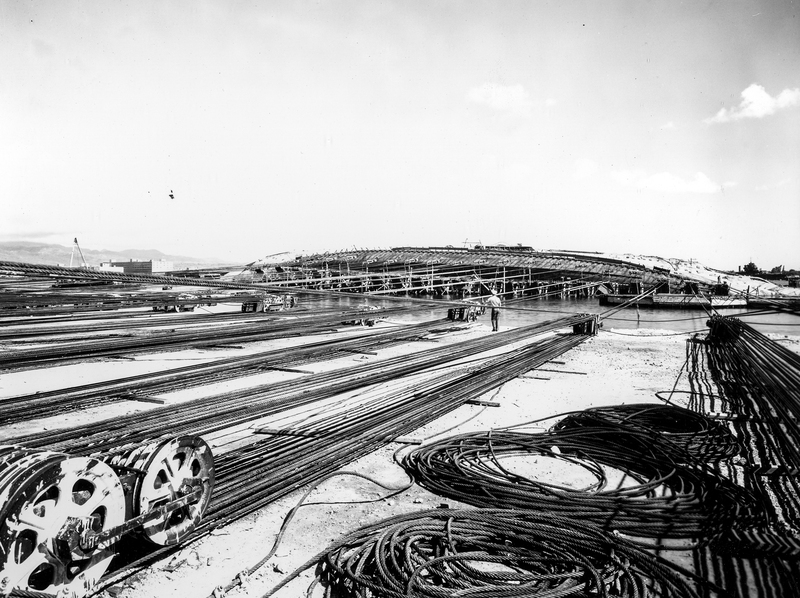 As that work continued, other teams emplaced twenty-one massive winches on Ford Island. The salvage team rigged cables between the ship and the winches, and these were used to gradually pull the Oklahoma upright. It was a slow task that required intricate engineering work. 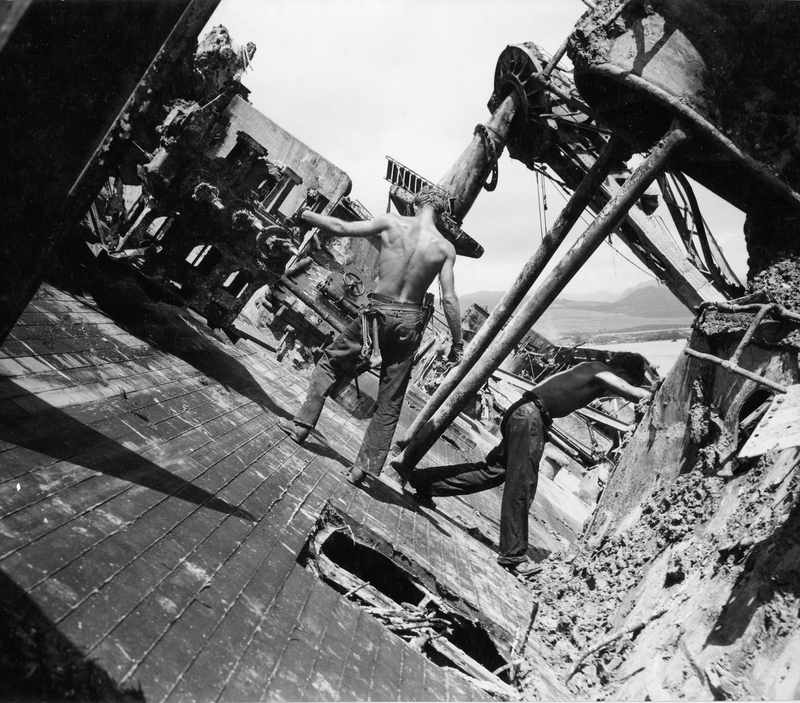 After three agonizing months, the winches finally righted the wrecked battleship. 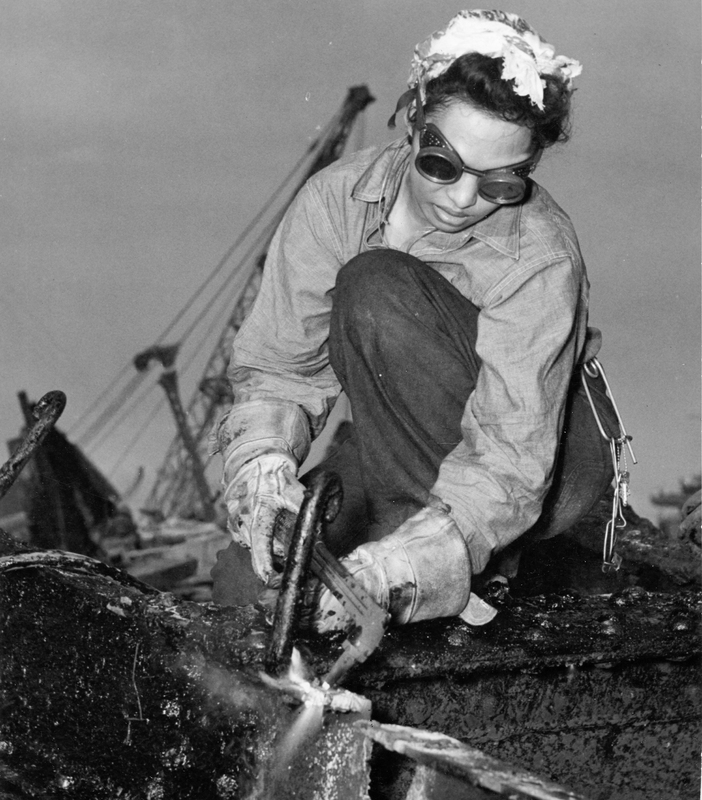 A civilian salvage worker aboard the Oklahoma in 1943. 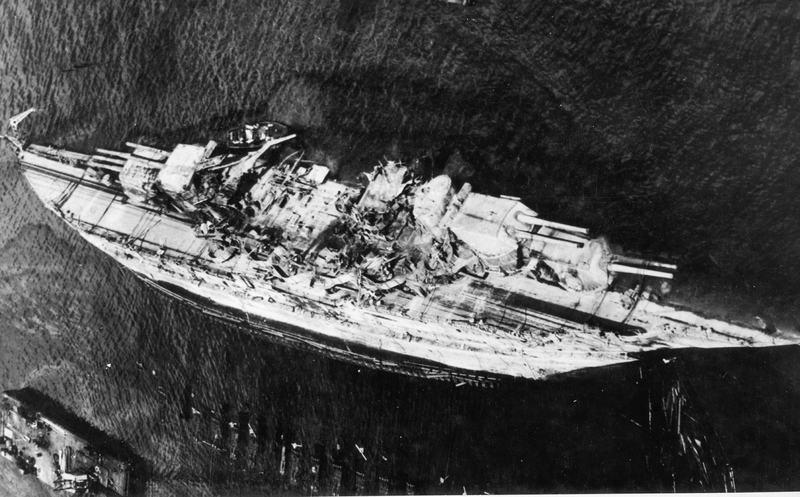 This was grueling, dangerous work which included having to recover the remains of hundreds of fallen sailors who’d been trapped aboard the battleship when she turned turtle. Once back on an even keel, the work to make her watertight was finished. 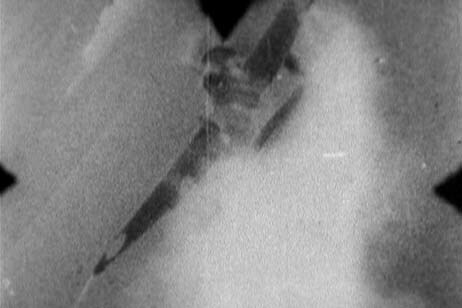 Machinery, the rest of her ammunition and weaponry were pulled off and she was basically stripped to await scrapping. She was eventually towed to drydock where the work was finished. She spent the rest of the war moored in the harbor as a silent reminder of that terrible day in December 1941. She was sold for scrap after the war, but while under tow to San Francisco in May 1947, she and her two tugs encountered a heavy storm. The battered old battlewagon couldn’t take the rough seas. She began to take on water, and a dangerous list developed. As she began to sink, the Oklahoma nearly dragged both tugs down with her. Fortunately, quick action on the part of the tugs’ crews prevented such a disaster. Oklahoma went to the bottom some five hundred miles east of Pearl Harbor. 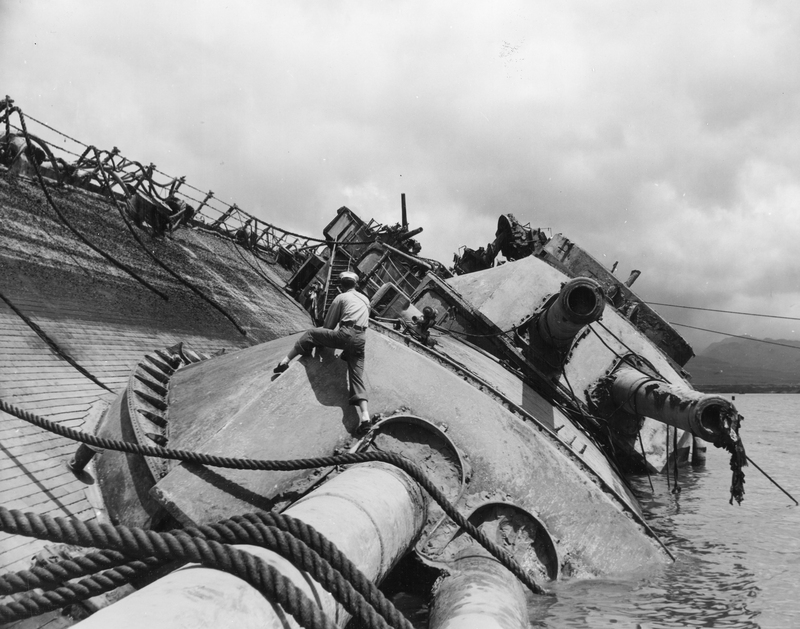 Her hull may lay in an anonymous Pacific grave, but her heart was torn out on Battleship Row in 1941.